The view was incorrectly captioned in the original as Council House Street instead of Old Court House Street as evident from the description. Old Court House Street connects Esplanade Row (East). It acquired its name from the old court house, that was located where St. John’s Church now stands. The northern part of the stretch is known as Dalhousie Square (East). It was constructed around 1781, when the finishing touches were put to the new Fort William. 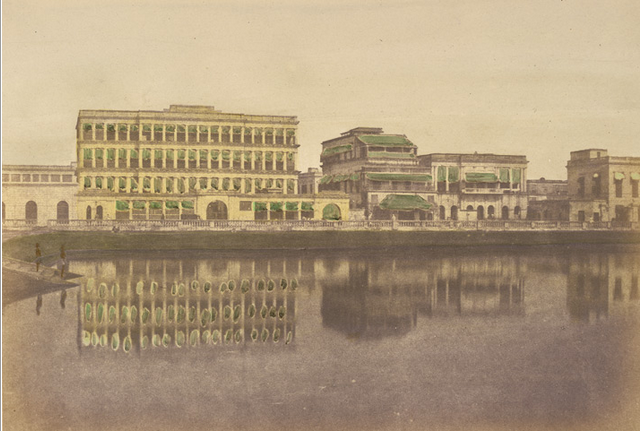 It is linked with the name of Col. Henry Watson, who brought about many improvements in Calcutta, including the laying out of surrounding Esplanade. The Red Road is an extension of this street. Council House Street connects the western part of Dalhousie Square with Esplanade Row. The view of the St. Andrews Kirk, and Great Eastern Hotel can be seen in the present location. Interestingly, the scene captured in the shot is found an exact match in ‘Old Court House Street‘ – a wood engraving by some unidentified artist. This image is a whole-plate albumen print from wet collodion glass negative of photograph taken by Frith Frith in 1850s. 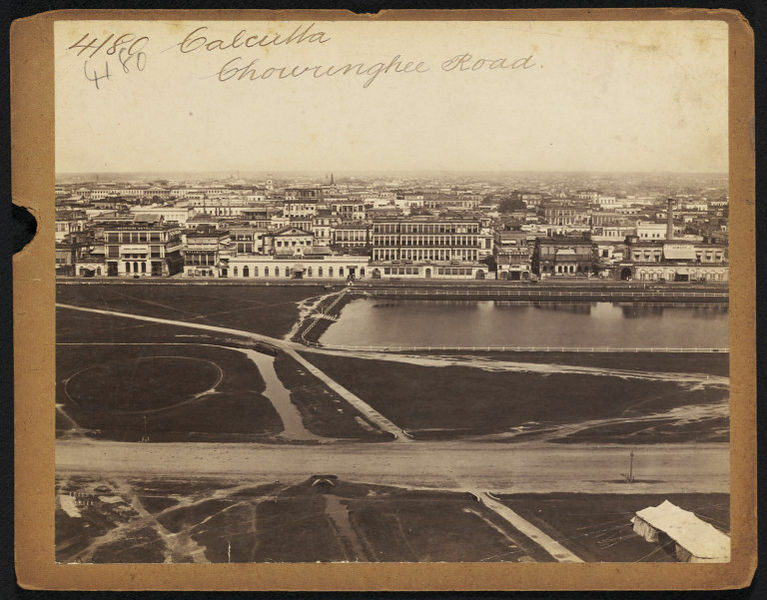 A wide-angled view of Esplanade area from the top of Ochterlony Monument, Calcutta published in the magazine, The Graphic, in 1875. A wood engravings by some unidentified European artist. Here is another panoramic view of Esplanade area focused on the Chowringhee road – the most elegant part of city. The city was then known as ‘The City of Palaces’ due to the impressive array of public buildings along with Esplanade Row and Chowringhee Road. The view of the Chowringee Road, on the far side of Maidan and Dhurrumtala Tank, was probably taken from the top of the Ochterlony Monument like the two other photographs he took focusing on different points, one on the Government House and the other on High Court. This is a view looking across the Dhurrumtollah Tank towards the buildings along Esplanade Row. 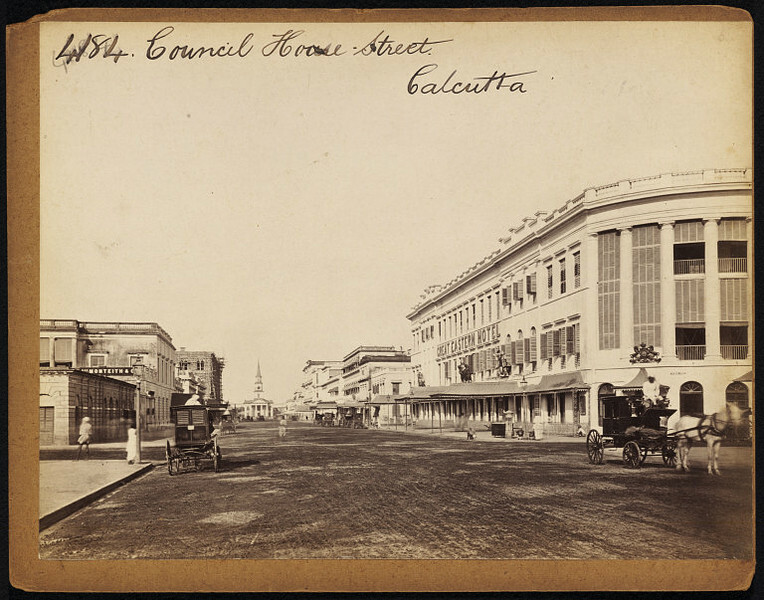 The Military Club, later United Services Club, and finally the Bengal Club, is the four storied building on the left. When the Bengal Club was first conceived in the winter of 1826-7, it was christened the Calcutta United Service Club, at a meeting held in the Calcutta Town Hall. It was presided over by Lt Col the Hon J. Finch, who was later to become the first President of the Club. The Club was housed in a building in Esplanade West, erected in 1813. Fund raising was through the then popular method of lottery. This large neo-classical building now houses the Geological Survey of India. 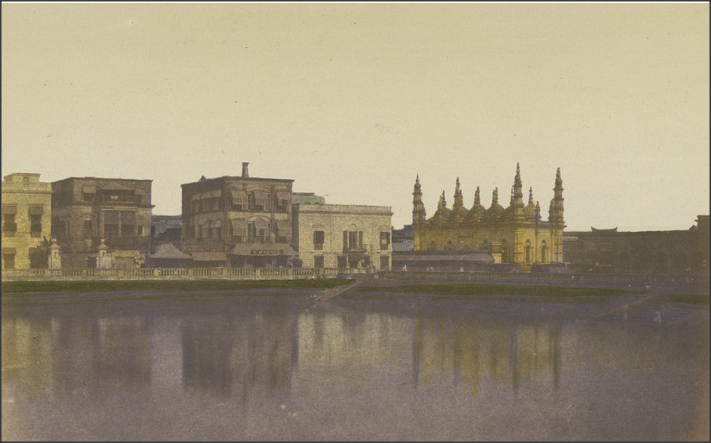 A hand-coloured print of the Military Club House, Calcutta, from the Fiebig Collection: Views of Calcutta and Surrounding Districts, taken by Frederick Fiebig in 1851. It was the historic occasion whereby official announcement was made that the political authority of the East India Company had ceased to exist, and that the Government of India had been transferred to the management of the Crown. The document was read in English by Mr. Beadon, and in Bengali by Babbo Samachurn Sircar. At the conclusion the Royal flag was hoisted a the head of the mast erected for the occasion before Government House, and it was saluted by the cheers of the European portion of the crowd, led by Mr. Halliday on the first round, and again by a sailor who hoisted the flag, and who had placed himself conspicuously on the Dragon Gun. From the Esplanade to Tank Square the entire space was alive with a surging crowd. This view was taken from Thomas Graham’s house in Chowringhee with part of Fort William in the background. Viscount Valentia George Annesley wrote of the Esplanade: “in an evening it is covered with the carriages of the richer inhabitants, who drive rapidly along, and with their numerous torch-bearers, form a singular and pleasing scene. The houses are built of brick, covered by a brilliant stucco, there called chunam, which takes a polish nearly equal to scaglioni marble”. This aquatint was taken from plate 3 of Henry Salt’s ‘Twenty Four Views in St. Helena, the Cape, India, Ceylon, the Red Sea, Abyssinia and Egypt’. 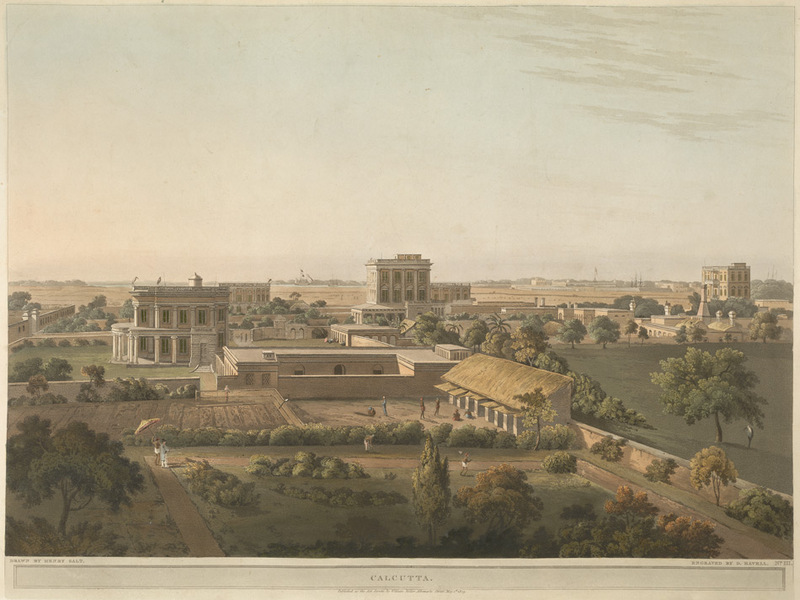 As the capital of the British in India, there were more views made of Calcutta than of any other city.